Is It Time To Cool It On Kale Already? : The Salt It's National Kale Day, folks. That prompts the question: Has the kale love gone too far? As we make kale the health halo food du jour, we risk turning it into the Gwyneth Paltrow of the vegetable world — a perceived goody two-shoes that, deservedly or not, everyone loves to hate on. Are we putting too much pressure on this little superfood that could? Let's start by agreeing to this premise: Kale is very good for you. And yes, we here at The Salt have been known to indulge in — nay, crave — kale chips and kale salads on a not infrequent basis. Still, when we found out that Wednesday is National Kale Day — featuring a kale dance party (we kid you not) — we couldn't help but think: Come on, people, the kale love has officially Gone. Too. Far. Turns out, the ringleader of this spanking new holiday is Drew Ramsey, a psychiatrist at Columbia University who wears his passion for the dark, leafy green on his sleeve — or perhaps more aptly, on his book jacket: He's the author, most recently, of the cheekily named 50 Shades of Kale, a book of recipes. Ramsey specializes in the link between nutrition and mental health, and says kale first drew his attention because of its excellent concentration of nutrients, including vitamin C, vitamin A, vitamin K and omega-3 fatty acids. And he became convinced that advising patients to eat kale was one of the most important pieces of advice he could give them. "Food is a big part of my practice, and I realized that the standard messaging — telling people to avoid fat and cholesterol — was unhelpful because it doesn't help people fill their plate," Ramsey tells The Salt. "Instead we need to be telling people what foods we want them to eat — nutrient-dense foods like kale, mussels and farm-fresh eggs." 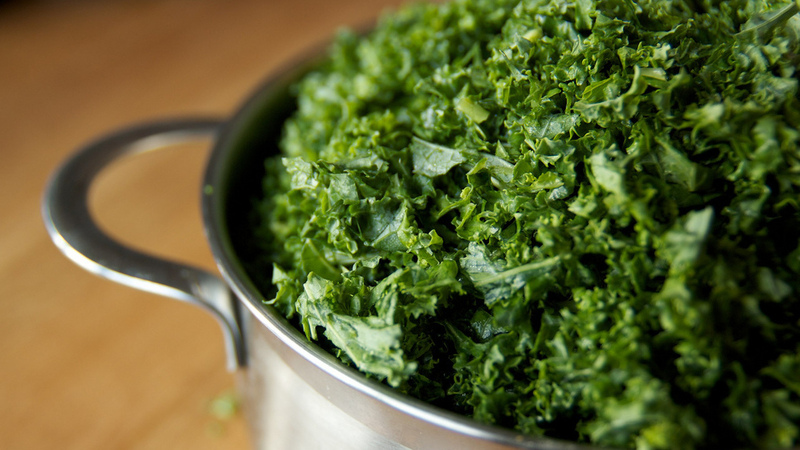 As Ramsey sees it, kale is also an ideal antidote to a public health crisis. And his kale evangelism has been growing ever more fervent in preparation for National Kale Day. Ramsey's "festival of kale" includes several scheduled Google+ Hangouts and a kale health summit. Then there's the aforementioned kale dance party, complete with kale cocktails, at Seasonal Whispers in Soho in New York City (You can dance along at home via the magic of Google+ Hangout). "Our goal is to get more converts," he says, "especially kids in school and kale newbies who have heard about it but haven't actually tried it." All of which is laudable — except there's a small problem with superfood evangelism. As we've reported many times, it can be dangerous to fixate on individual foods as curative sustenance, because your diet's influence on your health is an incredibly complex equation. The dangers of elevating this cabbage cousin to canonization status were brilliantly illuminated recently by food blogger Melissa McEwen. In a satirical post on her blog Hunt Gather Love, she enumerated the "dangers" of eating kale, including its "horrific effects on livestock" and that it's laden with pesticides. The post, by the way, was meant to show how easy it is to demonize a food by selective citation of scientific studies, but it also does a good job of noting the dangers of focusing your diet almost exclusively on one ingredient — "which I think anyone will agree is a bad idea," McEwen writes. And as a recent New York Times article reminded us, kale is not universal. In France, where kale is often seen as a reminder of the dietary deprivations of World War II, an American woman named Kristen Beddard is waging a crusade to put this trendy green on menus far and wide. (Not surprisingly, Beddard happens to be on the board of National Kale Day.) A noble quest, perhaps, but is it also a necessary one to save the French? As French food writer Sanaë Lemoine noted to the Times, "They don't need magical vegetables or superfoods. They already have a tradition of eating balanced meals. In a strange way, kale is superfluous." Still, such snickering will not deter kale crusader Ramsey. To all the naysayers, Ramsey has this to say: "Eat more kale to improve your attitude."